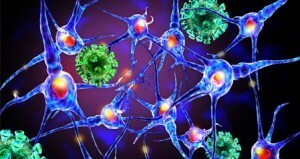 Each of these neuronal antigen targets were chosen because of a correlation with symptoms of neuropsychiatric behavior. Many targets were originally screened and tested, and did, or did not, show significance. 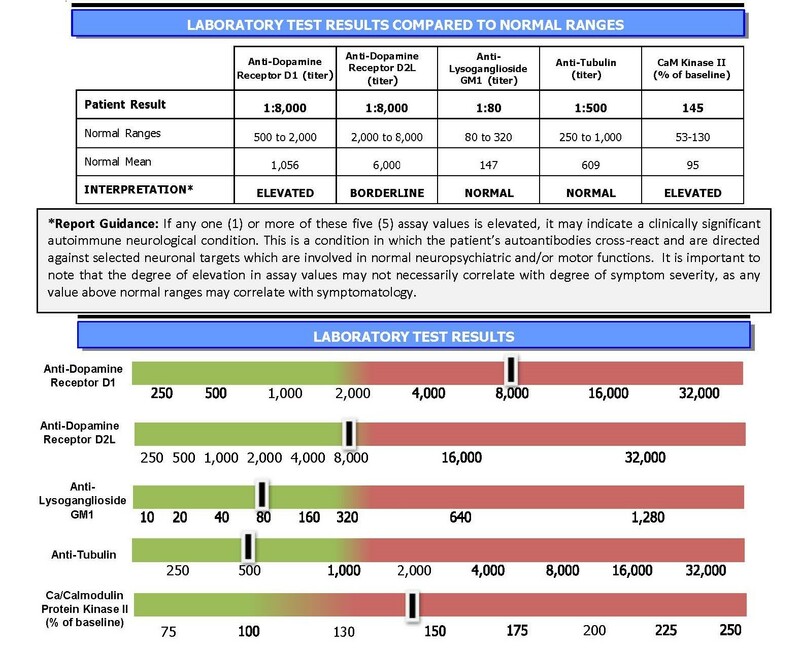 The tests we selected include the four (4) autoimmune neurologic targets (anti-dopamine D1, anti-dopamine D2L, anti-tubulin and anti-lysoganglioside) which are highly concentrated in neuronal cells in the brain and have involvement in neuropsychiatric and/or motor movement activity. Dopamine D1 receptors are highly concentrated on post-synaptic neurons in the brain whereas Dopamine D2L receptors are highly concentrated on pre and post-synaptic neurons. 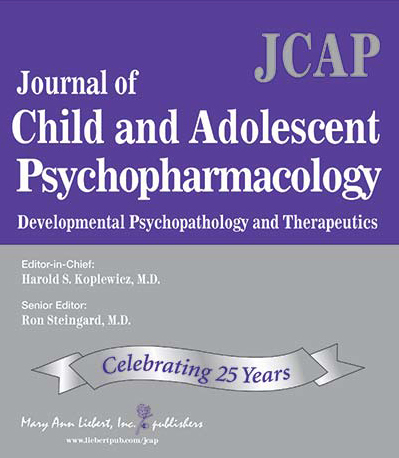 Normal functioning of dopamine receptors are responsible for many neurologic processes such as fine motor control, cognition and other forms of behavior. Lysoganglioside GM1 is concentrated in the central nervous system and associated with membranes of nerve cells. Autoantibodies directed against lysoganglioside may interfere with normal neurologic activity and have also been associated with degenerative neurologic conditions such as Guillain-Barre syndrome and other neurologic disorders. Tubulin is an intracellular scaffolding protein located in all cells but in high concentrations within the cells of the brain. Anti-tubulin antibodies may interfere with normal neuronal cell function and have been associated with other autoimmune related conditions such as Hashimoto’s Thyroiditis and other autoimmune thyroid conditions. The fifth test, CaMKII (Calcium-dependent Calmodulin Protein Kinase II) is a cell stimulation assay in which human serum is incubated on human neuronal cells. CaMKII is involved in the up-regulation of many neurotransmitters in the brain. The increase or stimulation of CaMKII activity by serum antibodies is measured compared to a baseline control and elevated activity may be associated with an infection-triggered autoimmune condition. Each of the five tests include a “Normal Range” which is a range of values ascertained by testing an appropriately identified normal pediatric population for this type of panel. The normal ranges are listed in a table under each of the five test headings. 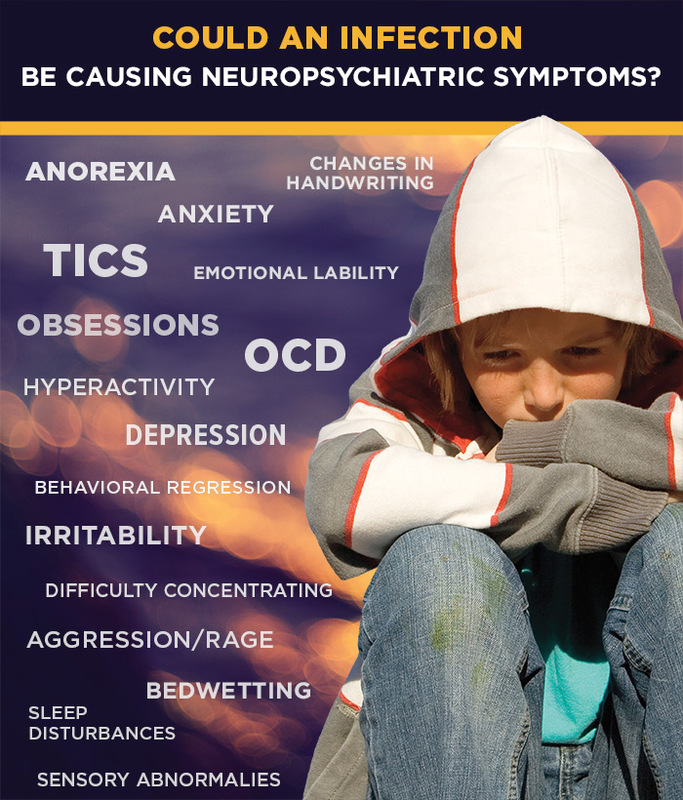 Neuropsychiatric Disorder diagnoses are based upon defined clinical characteristics. The results from the Cunningham Panel™ are provided to the physician as an aid in their diagnosis of Neuropsychiatric Disorders. Because these are metabolic tests, laboratory values can change over time and certain immune modulatory treatments may affect the laboratory results. These treatments include intravenous immunoglobulin (IVIG), plasmapheresis or plasma exchange, and steroid treatment. Therefore, we recommend taking specimens prior to these treatments or waiting 6-8 weeks after treatment although timing of the test is best determined by the ordering prescriber. Please tell us about yourself so we can send you the appropriate updates on testing and research for Neuropsychiatric Disorders.